Ping. Clayhanger Community Centre is on twitter! Clayhanger Community Centre has offers of grass cutting and general maintenance, administration, book keeping, sourcing funding, first aid, and perhaps most exciting, a DIY SOS style intervention has been offered to address the issues with the roof and other areas which need attention with the building! Wow! The response for offers of help at Clayhanger Community Centre has been overwhelming! If you have offered to help via a facebook thread, the office manager for Clayhanger Community Centre will be in touch shortly. So the Directors know where to contact people when the time comes, please complete this contact form and any future communication will be via email. Clayhanger Community Centre – what future? 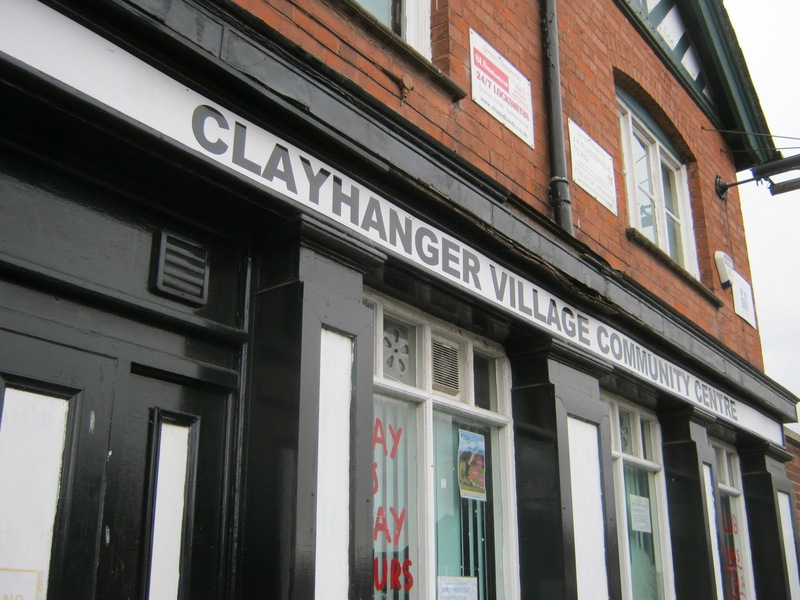 Back in October 2012, Clayhanger proudly announced that it had a Community Centre. Saved from certain demolition, the former George and Dragon public house was leased by Walsall Council to a team of Clayhanger residents determined to make the building work for the young people of the community. Almost 4 years on, after hard work, dedication and sacrifice, the funds have run dry and the original team of directors are left over-stretched and in need of help. A public meeting was called therefore, to present the current situation and determine what the future may bring for Clayhanger Community Centre. As ever, directors Karen Johnson, Karen Hollender, Becky Bryan and Lisa Taylor are cheerful and welcoming. The numbers in attendance are encouraging but not overwhelming. Karen explains that having run the centre for several years with financial support from Rosie’s Helping hands, the money is due to run out in September as Rosie’s is disbanding and support promised by Walsall Voluntary Action has not been kept. Clayhanger Community Centre (CCC) has relied on this funding to pay the running costs of keeping the building open and very little is made from the clubs and groups who use the building. Confirmed by Laura Terry and Labour Cllr Steve Wade, Area Partnership and Walsall Council have offered some funding and the directors would gratefully receive this money which is intended to cover running costs and some maintainence over the next 12 months. The main concern is that the building is being underused. Admirably, the directors would not want to receive the cash offered only to find that the building is not used more widely by the community which it intends to serve. A ‘checklist of requirements’ is needed so that anyone wanting to run a club or group from CCC knows exactly what is required to cover health and safety, first aid and safeguarding. The directors need help with administration, marketing, fund raising and finance. The loose roof tiles will only become worse over the winter and further damage will increase the cost to any repair. The roof needs fixing as a matter of urgency. There is an organisation (A Stars Sports) which may be interested in using the building and grounds to run a variety of clubs for children but discussions are very much in the early stages. The current funding offered would keep CCC open for a year. The situation will be reviewed again in 12 months time. The AGM for CCC is in September, at which time, the directors could welcome new members onto the committee and roles defined. Having a ‘to do’ list is all well and good and the directors are very experienced at doing what needs to be done, but that’s just the point. They have been doing it, on their own, for too long. Whilst the building needs money what is needed more is people and skills. As a prosperous village, with a demographic of managerial expertise in the workplace, there is plenty of it about. Clayhanger Community Cente could be a thriving charity. It’s rooms could be booked out seven days a week and many groups and clubs could benefit from the intimate nature of the rooms offered. Think carefully about the skills you have – administration, finance, marketing, advertising, communication, health and safety, construction – the list is endless. Could you make a commitment to offer a few hours a month for a year to invest in your local community? Many workplaces have a policy of allowing employees paid time off to support the local community. Does your place of work offer this scheme? If it does, take advantage. It was heartening to see that, as well as making suggestions, there were offers of practical help from those in attendance. More is needed though and the more help and support there is, the easier the load will be. The coming year is full of promise and exciting times for the Community Centre in Clayhanger. Be part of it, make history, give something back. To get in touch with the directors at CCC, link to the Facebook page or use the form below. 30 Days Wild: Day 30 birds of a feather. The final day of #30dayswild is concluded with a long walk in the company of a good friend and our hounds. We take in our regular route and catch up with the week’s news. Brexit is a hot topic for us this evening but then so is coconut rice so I think we covered all the important issues there. The Swan family accompany us for a while. 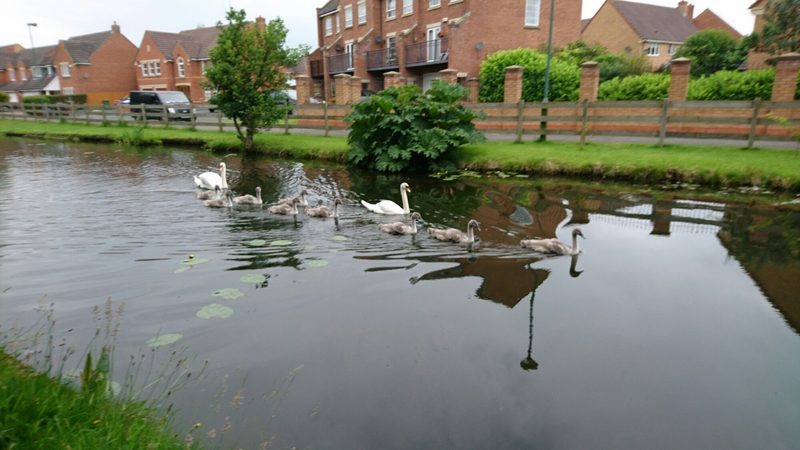 Nine cygnets! They’ve done well this year. 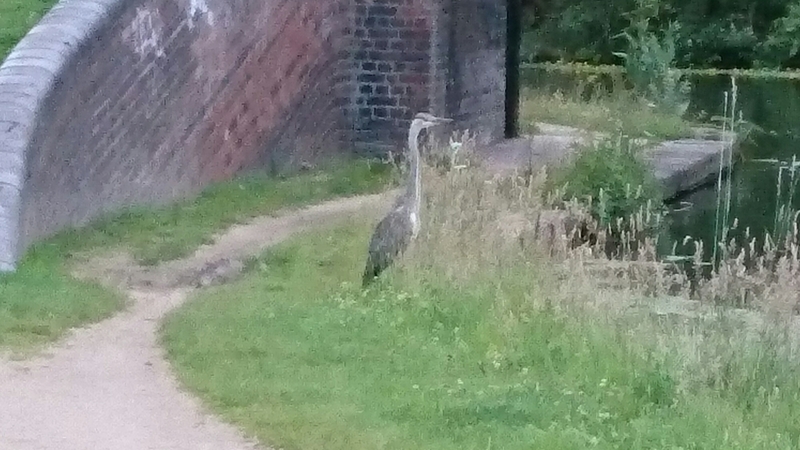 Further on in our walk we encounter the heron, standing so still that the dogs don’t notice him until they are about 6 feet away. I say ‘he’ I’ve no idea of the heron’s gender. On the dog’s approach he gracefully launches himself and settles on the opposite side of the canal. My friend and I wonder at how he can fly with those long legs. They simply seem to tuck away, just like the landing gear of an aeroplane. 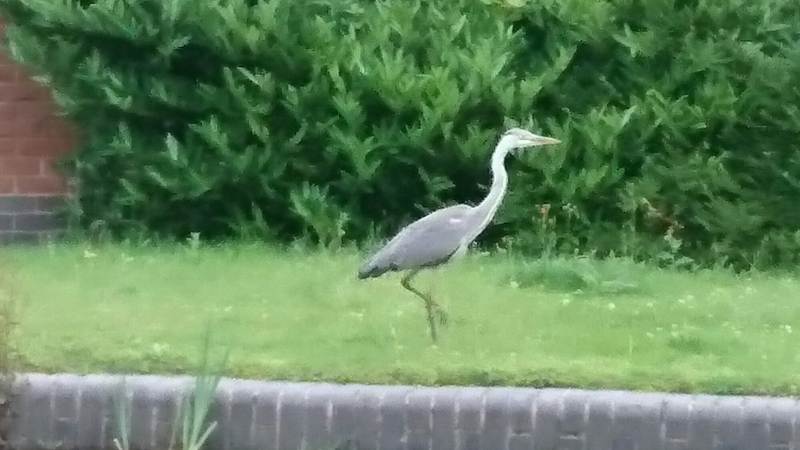 A great walk is over and so is #30dayswild. Me though, I intend to #staywild. One of the things I have really enjoyed about #30dayswild has been just waiting each day for nature to pop up and reveal something to me. Today, the penultimate day, nature pulls out a corker in the form of this lovely rainbow. For some it is the sign of a promise of love and better things to come, for others, it’s a fairy tale pot of gold. I’m sure though, for everyone, it is just simple beauty and the wonder of the world represented by a colourful arc of reflected light. In times where nothing seems certain and everything could change, how wonderful it is to look up and take in the simplicity of the rainbow. It instantly transports you to childhood again and reminds us that we are so, so, small in the grand scheme of things. Some things are just much, much bigger than we are. After taking a walk out with local birder Chaz earlier in the spring, I have been trying to identify birds by their call. One which I learnt very easily was the Green Woodpecker. The cackling, manical laugh is unmistakable once it’s been pointed out to you. Often heard, but not so much seen. Well, what should I spot when pulling into the bottom of the cul-de-sac this evening but a Green Woodpecker! It flew off very quickly and I suspect it was a juvenile. Nice to see him though. 30 Days Wild: Day 27 – All of a flutter. I do think it’s sad that we don’t see as many butterflies as we used to. Maybe my memory is fooled by nostalgia, but I remember seeing all sorts in mum and dad’s garden. Lots of them too. I used to catch them and let them go after having a good hard look at them. I’m not so good at identifying them now but we do get a lot of peacock butterflies when the buddleja is in bloom. Never seen one of these though. A ringlet butterfly. Not flashy like the peacock, but pretty and rather gothic-looking when it flies. It’s a deep brown colour and quite hard to spot if it weren’t for the rings on the underside of it’s wings. Here’s hoping for a good show of butterflies later in the summer. I could put it off no longer. The garden/jungle had to be tackled. Although letting the weeds grow 6 feet tall has brought plenty of wildlife. My favourite has been watching Mr and Mrs Bullfinch eat the seed heads off the dandelions. I shall definitely leave a patch of them in future. The hound retires to her favourite cool place when the sun is out. The bush she is under is alive with bees and occasionally she lazily snaps at one. She hasn’t learnt her lesson from the thick lip she got last year. 30 Days Wild: Day 25 Litter Picking! Saturday morning at 8.30, brought the beginning of the second Clayhanger Litter pick. Meeting once more at the co-op carpark, 8 volunteers gave their time to have a ‘Summer Tidy’ around the village. Litter pickers and bags are provided by Walsall Council Clean and Green and the full bags are collected by Clean and Green at the end of the pick. After a quick tidy round the co-op and along Northfields Way, volunteers set to work along the hedgerow on Clayhanger Lane towards the bridge. Another team began working down Bridge Street towards The Spot. It was the plan to tackle the litter in the undergrowth at the entrance to The Spot. However, it quickly became evident that this was a much bigger job than the time available and required more intensive support from Clean and Green. Steve Wade, recently re-elected Labour Councillor for Brownhills and Clayhanger, has offered his support in organising this for later in the summer. Perhaps it could be a large community event? Litter pick and BBQ? The area around The Spot has recently seen some anti-social behaviour and the litter is evidence of this. Due to the thick undergrowth there are several areas where ‘dens’ have arisen. I like a den as much as the next person, but please take your rubbish home with you! With half and hour or so left, three of us took to Clayhanger Urban Community Woodland and had a tidy around there. This is a fantastic resource and very popular with local dog walkers who like to keep an eye on what is going on up there. Indeed, I met both familiar faces and a new face belonging to a very friendly lady called Sue and her border terrier who explained that she often comes out with her own litter picker and has a tidy as she walks the dog around the fields and paths of Clayhanger. It seems that Walsall Council have done some work to clear the drainage ditch, presumably in order to relieve the flash flooding on the Pelsall Road we have seen during the heavy rainfalls recently. Again, some of the thicker hedgerows and ditches are full of rubbish and need some attention. Stepping into the wooded areas, the sound of the roads nearby is muffled and the sounds of nature are beautiful. An oasis indeed. It’s surprising how much litter can be collected by 8 people in just under 2 hours. Thirteen bags. A success again. Thank you Clangers. Your village and wildlife love you! The next ‘Clayhanger Autumn Tidy’ is Saturday 17th September 2016, 8.30-10.30 am. Meet at co-op car park. See you there.